1. How will creating a profile on Naukrigulf help me? or Do I need to create a profile if I am only interested in applying to some jobs? 1. One-click apply to Jobs: In future, jobseekers can use their registered email ID and password to login to Naukrigulf and apply to jobs with a single click. 2. Employers can search for you: There are Employers who prefer to look for matching candidates in Naukrigulf CV database. Once you create your profile on Naukrigulf you become searchable by these Employers thus opening newer ways of getting Jobs. 3. Get Jobs matching your profile: Jobseekers also receive jobs matching their profile on their registered Email ID. If you login to our iOS or Android app, you will receive timely notifications for the latest posted jobs matching your profile. 4. Login to the mobile site and apps for jobs on the go: You can login to our desktop site as well as the mobile site, iOS and Android apps with the login and password that you generated. Now, you can update your profile on the go and apply to unlimited jobs. 2. What is Naukrigulf database or Naukrigulf CV database? - It is a repository of profiles of all the candidates who are registered with Naukrigulf. - A profile contains data filled and CV uploaded during registration or profile update. 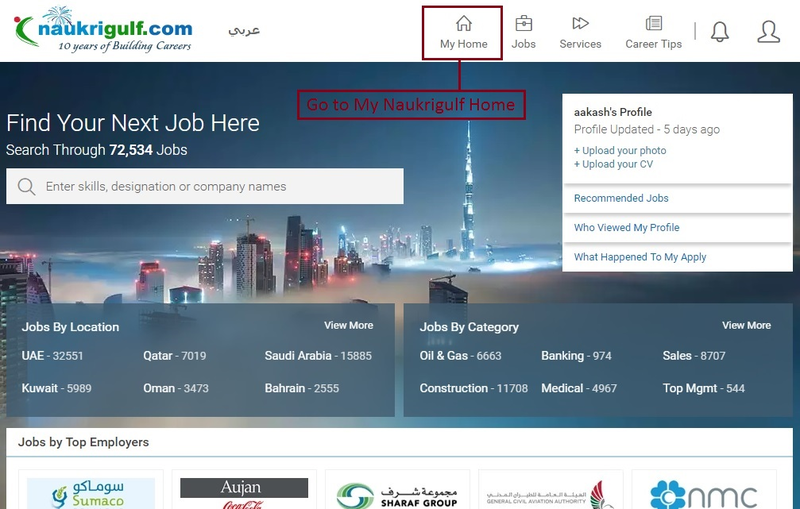 - Candidate can register on Naukrigulf through any platform (desktop website, mobile website, Android app or iOS app) to make their profile part of it. - Benefit: Everyday thousands of employers search through Naukrigulf database for relevant candidates. 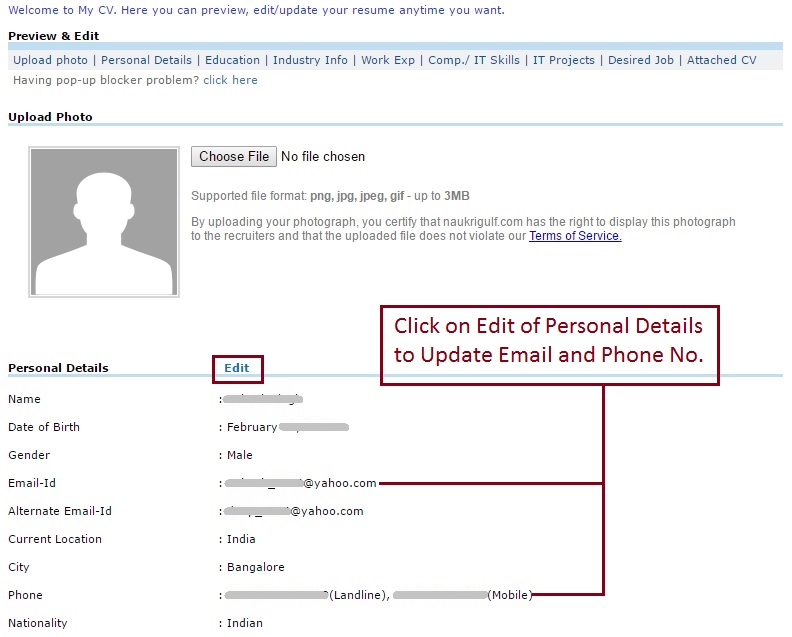 So if a candidate's profile is part of it, he/she may get contacted by employers even without applying to any job. 3. Do I need to pay any amount for registering with Naukrigulf or applying to jobs? Registering with Naukrigulf and creating a profile is absolutely free. There is no charge for creating your profile or for applying to jobs. Once you register with Naukrigulf, you are automatically added to the Naukrigulf CV database and can apply to unlimited jobs. 4. I am not currently employed. What should I enter as my Current Designation and Current Employer? If you are not currently employed but have worked before, you can mention the Designation and Employer of your last held job in the Current Designation and Current Employer fields. 5. I am a fresh jobseeker without experience or I have never worked before. What should I enter as my Current Designation, Current Employer, Work Experience, Industry, Functional Area, and CV Headline? 6. CV Headline: You may write an appropriate CV Headline which showcases your target job, industry and designation. For e.g. “Fresh Graduate looking for Sales jobs in Retail Industry”. 6. 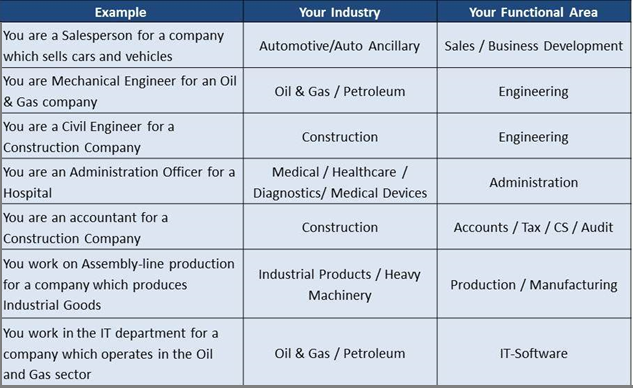 What is my Functional Area and Industry? 7. What should I mention as my Key Skills? Key Skills are the set of skills a job-seeker has acquired through his or her education, training, work experience or even life experiences. 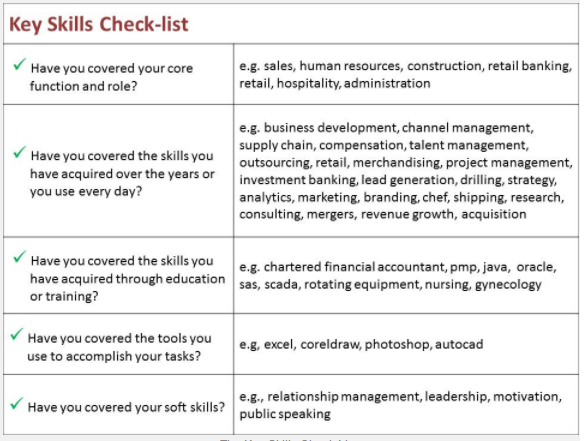 Around the internet, these are variously known as skills, keywords or specialties. Please see this link to get more help for Key Skills. 8. What should I fill as my Current Location if I shuttle between my home country and my current location? or I might not be residing at my current location after a few weeks or months. Candidates must mention the city/country where they are currently staying (at this point in time) as their current location. If there is a change location after a few days, please update your profile in Naukrigulf. Employers need to contact job-seekers through phone or email and conduct interviews either face to face or through video. These decisions can be taken only if the candidate has correctly updated his/her location in the Naukrigulf profile. 9. What should I mention as my Nationality? Your nationality is the country of which you are a citizen. It is NOT the country where you are currently residing. For e.g, if you are a citizen of Jordan but are working in the United Arab Emirates, your nationality would be Jordanian. In most cases, the country which has issued you a passport is the country of your nationality. 10. My CV is more than 1 MB. How do I upload it? Please try reducing the size of your document to less than 1 MB. You may try switching formats between one of pdf, rtf, word doc or word docx to see which one gives the least size. If you have added a photo or any other pictures to your document CV, please try removing them from the CV. You can always attach a photo to your Naukrigulf profile separately. 1. I have applied to jobs but I have not received a response yet. What happened to my application? All applications made to jobs posted on Naukrigulf are automatically sent to the Employers posting the Jobs. Thereafter it is up to the Employer to respond to your Job application. Naukrigulf is just a platform which lets you discover Jobs and Employers to receive your applications. However, if you are applying to a job posted on Naukrigulf, we have a feature which can help you get more information about your applications. This feature is available here. 2. Can I contact the employer regarding my application? Unless the employer has provided his/her contact details and has specifically asked you to contact him/her through the job description, it is not a good idea to contact employers directly. In most cases, recruiters/employers do not wish to be contacted through any Social Network or through contact information obtained via the internet about jobs posted on Naukrigulf. 3. I searched for jobs on Naukrigulf but I could not find one matching my profile. What should I do? If jobs matching your profile are not immediately available, please create your own job alerts. Please mention the Key Skills/Designations, experience, functional area to help us understand the kind of jobs you are looking for. We will send you jobs matching these criteria as and when they are posted. Please read more about alerts here. You can always use this link to create custom alerts. 4. When I try to apply to certain jobs, I am re-directed to another site in some cases. Why does this happen? In order to provide jobseekers with all the best opportunities from the Gulf region, Naukrigulf aggregates jobs from across the internet. This enables you, as a job-seeker, to search all relevant open opportunities from a single platform. These jobs are originally posted on the websites of various companies from the Gulf. While applying to these jobs, you must visit the website where the job has been originally posted. You are advised to use discretion while applying to jobs or sharing your information on non-Naukrigulf websites. 5. What is the difference between “New User Apply” and “Apply without Registration? If you are not yet registered with Naukrigulf, you may apply to a job by clicking on “New User Apply” or “Apply without Registration”. 1. Your full profile is sent to the employer who has posted the job immediately. 2. Employers can search for you: In future, you can use your registered email ID and password to login to Naukrigulf and apply to jobs with a single click. 3. 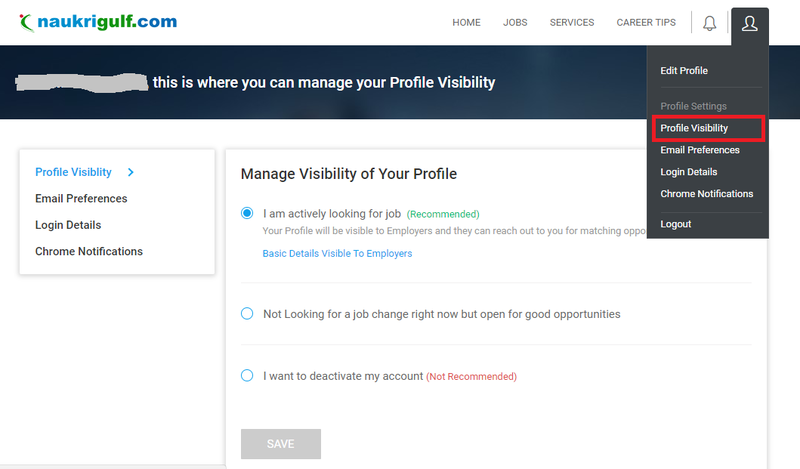 Get Jobs matching your profile: You will also receive jobs matching your profile on your registered Email ID. If you login to our iOS or Android app, you will receive timely notifications for the latest posted jobs matching your profile. 4. Login to mobile for jobs on the go: You can login to our desktop site as well as the mobile site, iOS and Android apps with the login and password that you generated. Now, you can update your profile on the go and apply to unlimited jobs. 6. Can I apply to the same job again? No. You can apply to a job only once from your account. Similarly, while Applying without Registration, it is possible to apply to a job only once. 7. Is there a limit to the number of jobs I can apply to through Naukrigulf? No, there are no limits to the number of jobs you can apply to. Your profile will be forwarded to the employers for each and every application made. However, it is highly recommended that you apply to only those jobs which match your profile with respect to Work Experience, Education, Location, Nationality etc. Please do read the Job Description and Desired Candidate Profile carefully before applying. 1. Why are there no CV views for my Profile? or Why have employers not viewed my CV? or I have applied to many jobs but why has no one viewed my CV? Viewing your CV in Naukrigulf database and viewing your application against a Job are two different things. CV views reported in your account represent the number of times your CV was viewed by employers while searching through Naukrigulf Database. This does not include the number of times your application was viewed for the jobs you applied to. As far as job applications are concerned, you can track their progress via 'What Happened to My Apply' feature from your Naukrigulf account. If Employers view your application, this information will be displayed in 'My Application Status' column. 3. I am not currently employed. What should I enter as my Current Designation and Current Employer? 4. I am a fresh jobseeker without experience or I have never worked before. What should I enter as my Current Designation, Current Employer, Work Experience, Industry, Functional Area, and CV Headline? 5. What is my Functional Area and Industry? 6. What should I mention as my Key Skills? 7. What should I fill as my Current Location if I shuttle between my home country and my current location? or I might not be residing at my current location after a few weeks or months. 8. What should I mention as my Nationality? 9. My CV is more than 1 MB. How do I upload it? 10. Can I send my CV to Naukrigulf through email? Yes, but you need to create an account on Naukrigulf before sending your CV to us at newjobs@naukrigulf.com. You can send it only from the email account registered with Naukrigulf. If we find that the email is registered with Naukrigulf we shall attach the CV with your Naukrigulf profile. Else your CV will be discarded. 11. 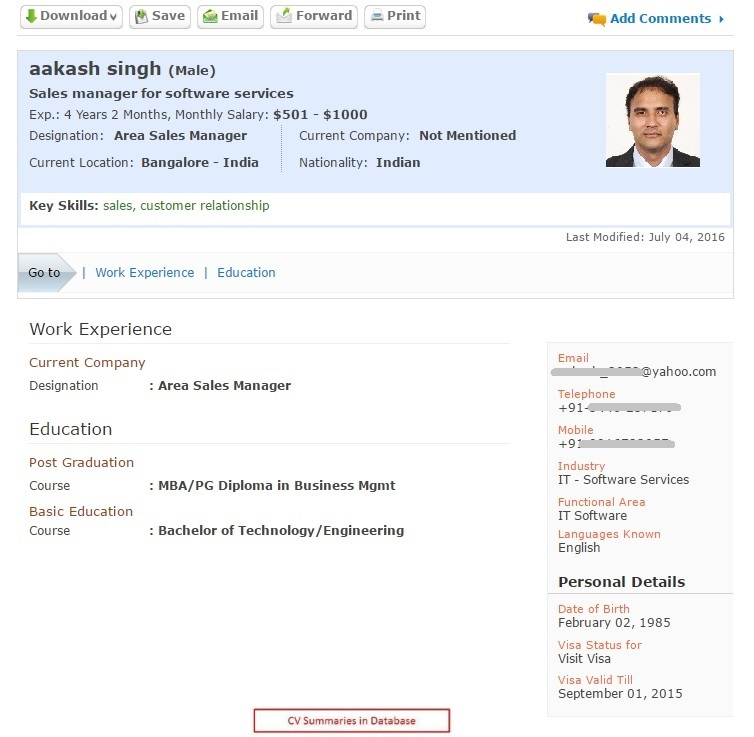 How does my profile appear to the employer? 12. How do I make my Naukrigulf profile private? 3. 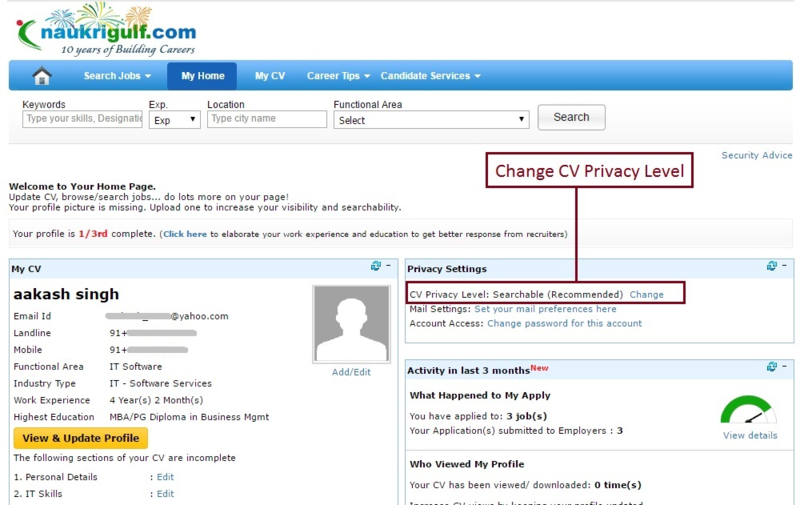 Scroll to the “Privacy Settings” section and click on “CV Privacy Level Change”. You will reach the Privacy Settings page. Your CV will have full visibility and employers will be able to view your profile while searching through the Naukrigulf database. 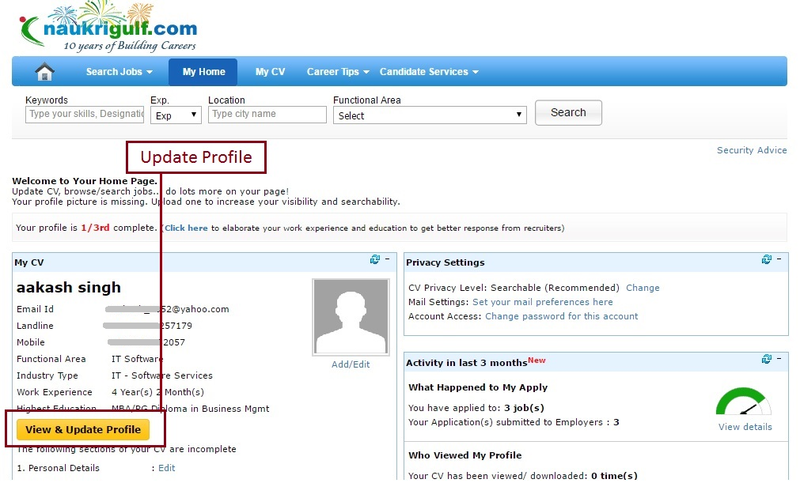 Employers will contact you for relevant opportunities matching your profile. Check the ones you want to hide. Please note that the information in your attached document CV will still remain searchable. 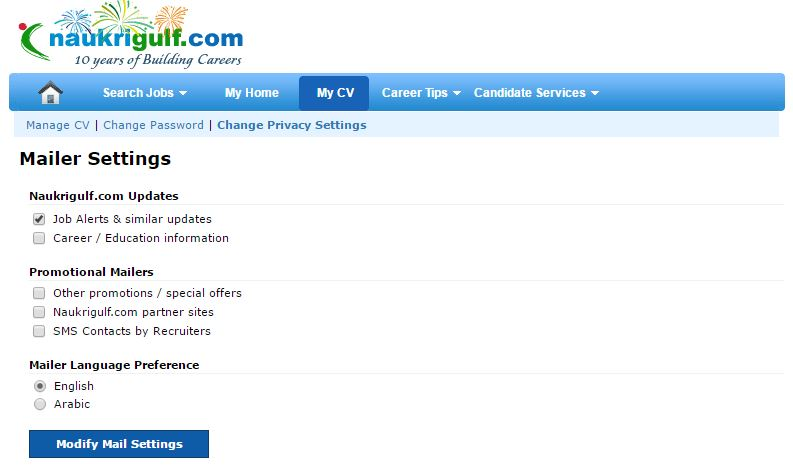 Your CV will not be searchable in the database and employers cannot view your CV. Please click on “Modify Privacy Settings” button once you have made your choice. 1. I am not receiving jobs matching my profile. I don’t want to unsubscribe from Job Alerts but I want to receive more relevant jobs. Naukrigulf job alerts will become more relevant if all the above information is complete and up-to-date. If for some reason, job alerts are still not relevant, you may create your own alerts. Please read more about creating your own alerts here or Create your own alert. 2. How do I deactivate or delete my account from Naukrigulf? 4) Choose a suitable option to Hide or Deactivate or Delete your account. We would strongly recommend you to either hide or just deactivate your account instead of deleting. This way you can always come back to Naukrigulf later to restart your job search. 3. How do I change my mail settings? or I don’t want to receive certain mails from Naukrigulf. 3. Scroll to the “Mail Settings” section and click on “Set your mail preferences here”. You will reach the Mail Settings page. a. Job Alerts: It is highly recommended that you keep this option selected. Job Alert mailers have jobs matching your profile and are sent once or twice a week. 5. Uncheck the options for stopping the emails which you do not wish to receive. 6. Please click on “Modify Mail Settings” button once you have made your choice. 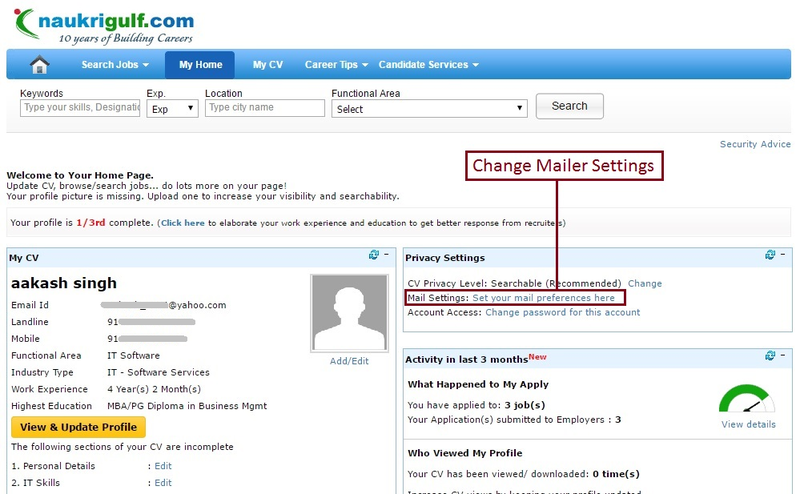 If you don't want to receive some Job alert mailers then use delete alert link in those mailers. You can also use unsubscribe link available in all our mailers to change your mailer preferences. 4. I want to change my email ID and contact details. 3. Click on the “Update Profile” button. You will reach the Edit Profile page. 4. Scroll to the Contact Details sections and click on Edit. 5. Update your latest Email and Phone Number, where employers can reach you. Click on Update. The update feature is also available on our mobile apps. It is strongly recommended that you provide an email and phone number(s) where employers can easily contact you. 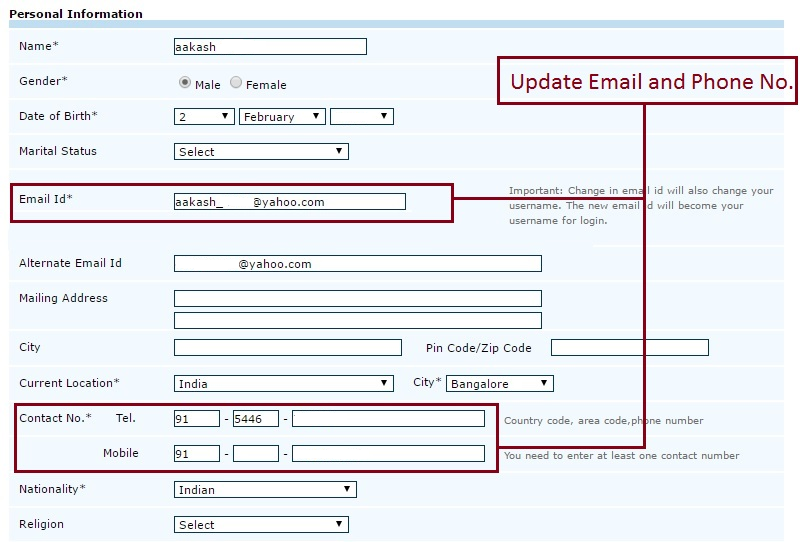 Please update these fields if and when there is a change in your contact details. Remember, when employers search for CVs in the database or want to contact you for job applications, they need contact details to get in touch with you. IMPORTANT: Please also note that if you change your email ID in the Contact Details, the new email ID will also become your Login Email ID. Please use this new email ID to login to your Naukrigulf profile. Your password will remain unchanged. 5. I have registered on Naukrigulf but I don’t remember my password. What do I do? Please click on the “Forgot Password” link on the Login layer or on the Login page. 1. On the Forgot Password page, please enter the email ID that you have used for registering with Naukrigulf. 2. We will immediately send you a link on your registered email ID that will let you reset your password. 6. I want to change the language of my mailers from English to Arabic or from Arabic to English. 4. You can choose one of two options for the language in which you want to receive your emails. 5. Please click on “Modify Mail Settings” button once you have made your choice.